1. Preheat the oven to 180˚C, gas mark 4; line a muffin tin with 9 cases. Put the spinach in a colander and pour over a kettle full of just-boiled water to wilt. Rinse the spinach under the cold tap, then squeeze out as much water as you can and dry between sheets of kitchen paper. Roughly chop. 2. Mix the flour, salt, mustard powder, cayenne pepper and baking powder in a large bowl. Beat the eggs in a jug, then stir in the yogurt and melted butter. Add a grind of black pepper. Make a well in the middle of the dry ingredients and whisk in the wet ingredients until completely combined. Fold in the chopped, wilted spinach, feta and salad onions. 3. Spoon the mixture into the muffi n cases. Bake for 30-35 minutes, covering with foil if they brown too quickly, until golden. Remove from the oven and cool in the tin for 5 minutes then transfer to a wire rack to cool completely. 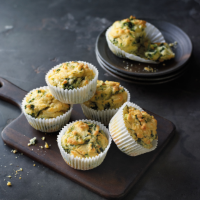 These muffins are great with sun-dried tomatoes too. Chop up 3 or 4, and add with the spinach. This recipe appeared within the October 2018 recipe card collection.